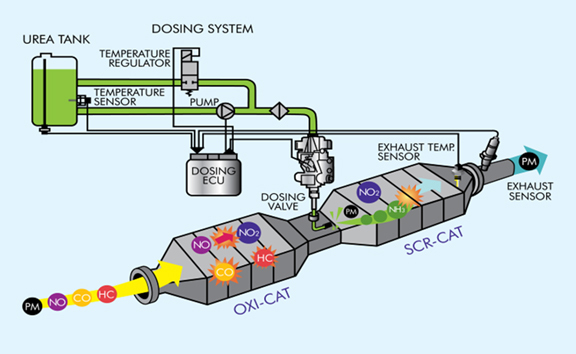 With SCR or Selective Catalytic Reduction, the nitrogen oxide (NOx) reduction process takes place after combustion – so as to not diminish engine performance. The process is simple: diesel exhaust fluid (DEF) is sprayed into the hot exhaust gases. The fluid consists of urea and deionized water. This mixture passes through a catalytic chamber. When the hot exhaust combines with the DEF within the catalytic chamber, the exhaust is broken down into harmless nitrogen and water vapor – two natural components of the air we breathe. The bottom line with EGR is it adds cost, complexity, hotter running performance and increased engine noise. Fleets were slow to adopt yet another technology especially after the impact of the EGR engines that reduced fuel mileage and added maintenance cost. In 2010 US fleets had reached a 20-year high in vehicle age at approximately 6.9 years. But, now they are ordering new SCR vehicles and they are growing rapidly. There were approximately 400 SCR equipped Class 8 vehicles at the end of 2012. Effective the first of this year 2013 100% of all diesel on-road vehicles are utilizing SCR technology. Why Tata Motors is offering both EGR and SCR in BS IV trucks and buses? Exhaust Gas Recirculation (EGR) technology adopted by Tata Motors in 2010 will continue to power small-to-medium category of commercial vehicles with engine power requirements up to 180HP. EGR helps toreduce NOx emissions from the engine. Additionally, Tata Motors has adopted the globally proven SCR technology since 2014 for its Medium and Heavy-Duty Commercial vehicles ranging from 130HP to 400HP. Tata Cummins Ltd, a JV between Tata Motors and US-based Cummins Inc. has developed these engines. SCR technology allows engine to operate at more optimal combustion temperature providing better power, fuel efficiency and lower NOx and particulate matter generation.